We decided to republish an updated version of this article from 2013 telling the story of three brave American heroes who served in Afghanistan. Army Ranger Cpl. Josh Hargis was severely wounded losing both legs from the knee down during a night mission in Southern Afghanistan on October 6, 2013, along with other members of the 3rd Battalion, 75th Ranger Regiment. A total of four soldiers were killed in the attack and forty were injured. A profoundly moving photo of Hargis saluting his commanding officer, Col. Christopher S. Vanek, warmed the hearts of people around the world after the image was sent to news agencies. The photo is set in a hospital room. 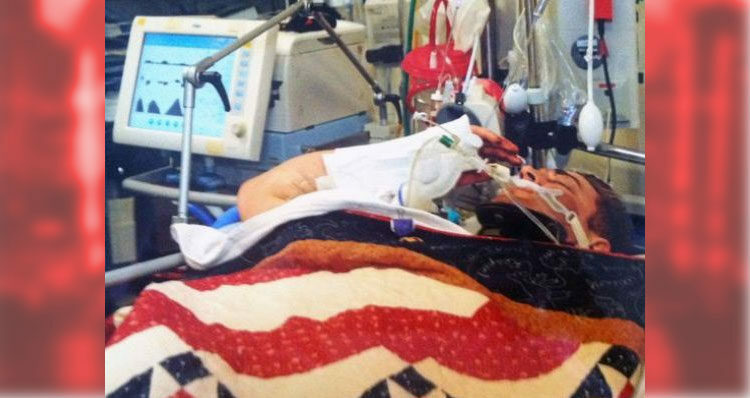 A patient with a neck brace, tubes attached everywhere, draped in a red, white and blue quilt, is lying in a bed. His bandaged right arm is raised in what we now know is a salute. His face is mostly obscured, but the photo captures details such as the color of the patient’s hair, the shadow of what appears to be a large bruise on his left cheek and a Purple Heart medal pinned to the quilt. She then posted the contents of the letter she received from Col. Vanek, the Commander of the 75th Ranger Regiment. “Josh was seriously wounded as you know and survived for almost two hours after his injury before arriving to the hospital. Josh was immediately pushed through a series of surgeries and emerged hours later into an intensive care unit here at our base in Afghanistan. Despite being in intense pain and mental duress, Josh remained alert and compassionate to the limited Rangers that were allowed to visit him bedside. “Prior to Josh being moved to Germany for his eventual flight to America, we conducted a ceremony to award him with the Purple Heart for wounds received in action. A simple ceremony, you can picture a room full of Rangers, leaders, doctors, and nurses surrounding his bedside while the Ranger Regimental Commander pinned the Purple Heart to his blanket. “During the presentation the Commander publishes the official orders verbally and leaned over Josh to thank him for his sacrifice. Josh, whom everybody in the room (over 50 people) assumed to be unconscious, began to move his right arm under the blanket in a diligent effort to salute the Commander as is customary during these ceremonies. Despite his wounds, wrappings, tubes, and pain, Josh fought the doctor who was trying to restrain his right arm and rendered the most beautiful salute any person in that room had ever seen. “I wanted to share with you and the family of Ranger Hargis that it was an Honor for me to be at his bedside during his purple heart ceremony. As a Navy Nurse here at Role 3 hospital, it was I that was holding his arm as he began to raise it up during the ceremony. Army Times provided additional information on the attack in a 2015 report detailing the bravery of Sgt. Bryan Anderson, a medic, and Staff Sgt. Jeffery Dawson, an explosive ordnance disposal technician. Both received the Distinguished Service Cross, a valor award second only to the Medal of Honor, for their bravery that fateful day. “The night of Oct. 5, 2013, started out as ‘any other night,’ Anderson said — yet another night mission to kill or capture a high-value enemy target in Afghanistan. “But the mission in Kandahar province, which stretched into the early morning hours, would be anything but ordinary, as the team of Rangers assaulted in to find multiple suicide bombers and a deadly belt of buried improvised explosive devices. Dawson and Anderson worked to clear pathways to victims of the attack through fields strewn with improvised explosive devices (IEDs). “As Dawson returned to the casualty collection point, Cpl. Joshua Hargis triggered another explosion as he tried to reach Peters,” a wounded soldier. “Dawson, who was less than five feet from the blast, suffered a ruptured ear drum and shrapnel wounds to his left side,” according to Army Times. “Completely disregarding his own wounds, Sgt. Dawson immediately moved to assist the platoon medic treating Cpl. Hargis,” the narrative from the awards ceremony read. “I got to Hargis, and I was looking at his legs, and I remember just reaching down and putting a tourniquet on his left leg while Anderson was applying pressure to his femoral artery,” Dawson said. “I was working on him for an hour and a half,” Anderson said. Hargis, who had suffered blast lung, needed help breathing. “It ended up being an hour and 37 minutes until we were off the ground with him,” Anderson said. Speaking about the events of that night, Dawson said that he relied on his training. Anderson also stated that the bonds between the Rangers was a key factor.